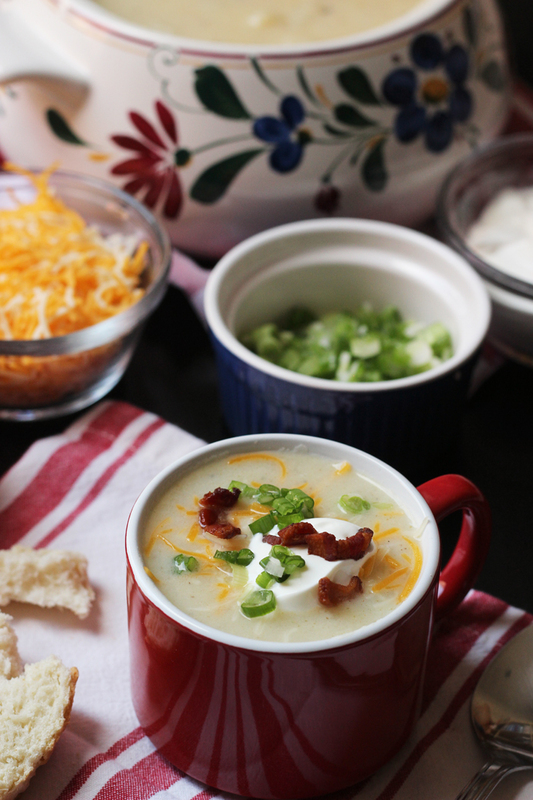 Enjoy a hot and hearty supper tonight with this Chunky Potato Soup. Seasoned with bacon and tarragon, this soup is perfect comfort food. 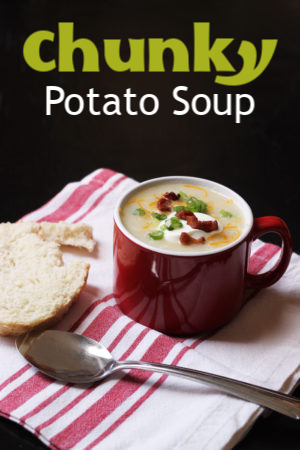 Potato Soups have long been among my favorites; they make a delicious bowl of comfort on a cold winter night. 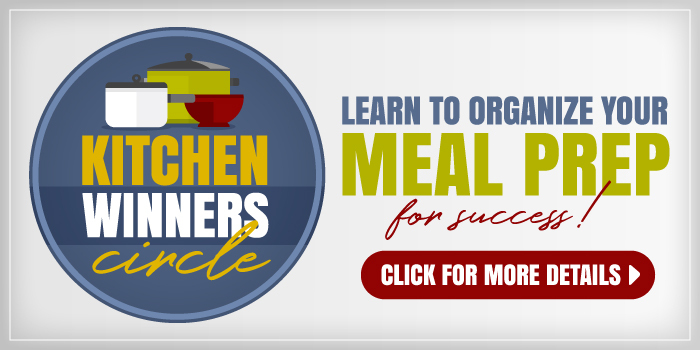 They are inexpensive to prepare, making them top on the list of budget meals. And they can be made with a handful of pantry staples — perfect for a throw together supper. 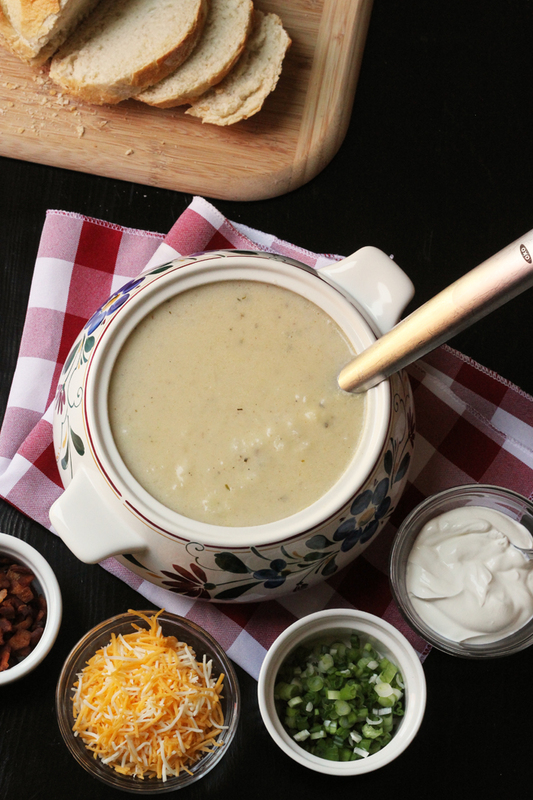 I am surprised that I haven’t already shared a Potato Soup here on the blog before. I say one, because yes, there are many. There’s the Potato Leek Soup in Good Cheap Eats and the Loaded Potato Soup in Good Cheap Eats Dinners in 30 Minutes or Less. Of course, there’s this yummy Sausage Potato Soup, but sometimes you just want to let potatoes be the star. Ya know what I mean? It can be made quickly in the pressure cooker. FishChick9 says it’s her favorite potato soup EVER. Seeing as this child has a mother of many potato soups, this is high praise, indeed. I was actually surprised that she said so because the tarragon gives it a distinct flavor. Clearly one that my baby girl loves. I find that the bacon and tarragon flavors really got boosted from being cooked in the Insta-pot (as I call it). Can I make this chunky potato soup on the stove top instead? 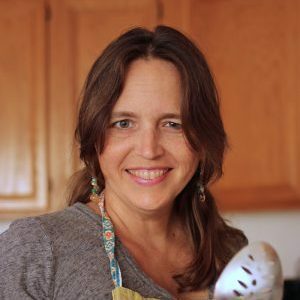 I’ve had numerous pressure cookers in my time — long before they were cool — but I am late getting into the pressure cooker recipe game. Slowly but surely, I’m finding things that I enjoy making in my Instant Pot more than making the traditional way. This soup just might be one of them. No fears if you don’t own an Insta-pot — you can easily make this soup on the stove top as well. I’ve included instructions for both below. What do I serve with this chunky potato soup recipe? My choice to go with a soup like this is some great bread – like this garlic focaccia. It’s one of my tips to make soup night a success. Stock up on ingredients when they are on sale. Stock up when you see bacon on sale and stash it in the freezer. Likewise, load up on onions and potatoes. Price match. Check your grocery store fliers to see who has the best price on the items on your list. It’s one tip I used to lower my grocery budget by a $100 a month. Make your own chicken stock. It’s practically free! It’s a great thing to stock in your freezer for a quick weeknight soup! This post contains affiliate links which provide a means for me to earn fees linking to Amazon and other affiliate sites. In a large heavy pot or the insert of a pressure cooker, saute the bacon until crisp. Remove the bacon to a plate lined with a paper towel to drain. Remove all but 2 tablespoons of the drippings from the pot. Cook the onions in the bacon drippings until tender and translucent, scraping up any browned bits. Stir in the potatoes and the garlic. Cook for an additional 2 minutes, stirring. Add the chicken stock as well as the salt, tarragon, black pepper, and cayenne. Simmer until the potatoes are tender, about 20 minutes. 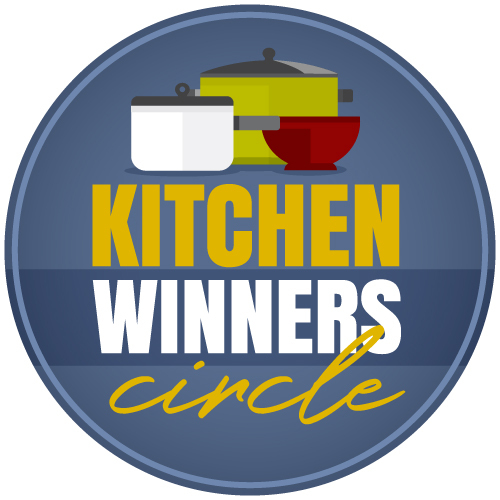 If you are using the pressure cooker, fit the lid and set to pressurized. Set the machine to manual for 5 minutes. When the time is up, use the quick release to remove the lid. Stir the soup, mashing the larger potatoes with the bowl of the ladle, until you have the texture you prefer. Stir in the cream. Adjust the seasonings and serve with the crisp bacon and other toppings. Looks good! My library is ordering your new cookbook upon my request. I’m eager to read it!